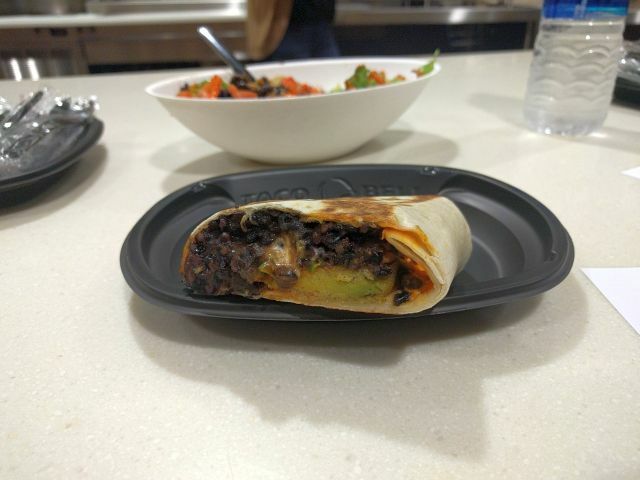 Taco Bell is set to test new black rice in a new burrito bowl that they're calling the "Forbidden Bowl." Black rice is sometimes called "forbidden rice" as it was once exclusively reserved for Chinese royalty. The name also plays on the fact that the bowl will be testing at only one location for only one week. 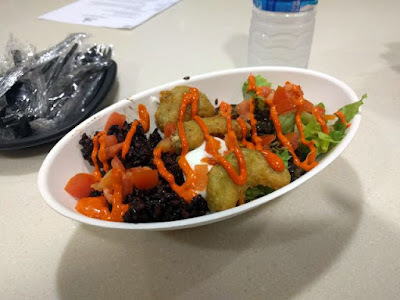 In addition to black rice (which is made with the same seasonings as their regular seasoned rice), the Forbidden Bowl also features new crispy-fried slices of avocado as well as new (and brightly orange) Forbidden sauce. From the regular menu, the bowl takes black beans, Romaine lettuce, sour cream, diced tomatoes, and a choice of either seasoned beef, shredded chicken, grilled chicken, or steak (shredded chicken is the default but I'm told the dish goes great with seasoned beef as well). It's also available as a burrito in addition to the bowl. In offering black rice, Taco Bell looks at adding a more nutritious option than white or brown rice that's also currently trending (although not quite popular) as a "superfood." In addition to the new ingredients, the menu item also sports a new white bowl made of heavyweight paper (similar to Chipotle's bowls) rather than the black plastic of the Taco Bell's current burrito bowl. Additionally, the bowl has a less-functional, more-artsy, half-ovoid shape to it that looks a little more like something your soup or salad might come in at a nice restaurant (except it would be made of porcelain at a nice restaurant). The Forbidden Bowl goes on sale starting this Thursday, September 14, 2017 at the Taco Bell at 2222 Barranca Parkway in Irvine, CA and will be available through September 21, 2017. The price for a beef Forbidden Bowl or Burrito is $3.49, while the chicken or steak version is $3.99. You can also get a beef Forbidden Bowl or Burrito as part of a $5 Box along with a Doritos Locos Taco, crunchy taco, and a medium drink.